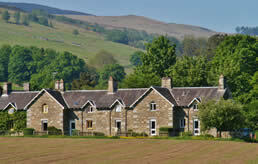 Tomgarrow has log burning stove and electric heating, electric showers and hot water cylinder. 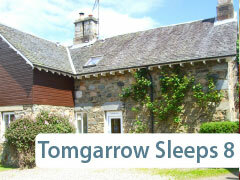 Tomgarrow is fully equipped with colour television, washing machine, microwave, electric cooker, oven and fridge. Bed linen, duvets and towels are all provided. Electric blankets are also available upon request. A separate drying area, which is lockable, is available to hang up wet clothes or store bicycles, it also houses a tumble dryer. An open air clothes line is also available just "behind the hedge". On the loch side 150 yards from Tomgarrow there is access to a boat house to store sail boards, diving equipment and the like. The Kenmore village shop provides a service where you may order a “starter pack’ of groceries to be delivered to Tomgarrow prior to your arrival should you wish. Payment may be made at the shop at your convenience. Cots and highchairs are normally available but should be booked in advance. We have just installed free WiFi, online booking and taken out the old coin meters.